The aim was to study the association between mood and anxiety disorders and the Tako-Tsubo Syndrome (TTS) and to determine the role of antidepressants and the impairment of quality of life due the comorbid psychiatric disorder. Case-control study: 19 consecutive patients (17 female) with TTS compared to 76 controls without TTS, were randomly selected from the database of a nationwide epidemiological study after matching (gender, age and residence) by controls. Psychiatric diagnoses were carried out according to the ICD-10 using semi-structured interview tools (ANTAS-SCID) administered by clinical staff. Quality of Life (Qol) was assessed by means of SF-12. Only Major Depressive Disorders (MDD) showed higher frequencies in cases with statistical significance difference (p=0.014) as well as at least one Mood Disorder Diagnosis [MDD or BD] (p=0.002). The lifetime prevalence of at least one anxiety disorder with no comorbid mood disorder did not show a higher frequency in cases (p=0.57). The score at SF-12 in the TTS group was similar to those of controls (p=0.71)In the TTS group, the score at SF-12 in people with one mood or anxiety diagnosis (N=7) was similar to those without mood or anxiety diagnosis (p=0.75). The use of antidepressants was higher in TTS group (15.79% vs 1.31%; p=0.030). The study shows an association between TTS with depressive disorders and antidepressants use and does not confirm the association with anxiety syndromes. 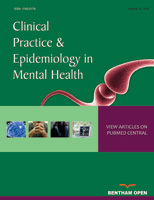 The study suggests the need to investigate the possible interactions between antidepressants use and mood disorders in studies with appropriate design and sample size. Keywords: Tako-Tsubo Syndrome, Mood disorders, Anxiety disorders, Post-traumatic stress disorder, Quality of life, Antidepressants, Psychiatric diagnoses.